Atapour, M., Abdollahi, S., Monir Vaghefi, S. (2014). The Effect of Erosion on Corrosion Protection Properties of Coal Tar Epoxy Coating. International Journal of Iron & Steel Society of Iran, 11(2), 17-22. M. Atapour; S. Abdollahi; S. M. Monir Vaghefi. "The Effect of Erosion on Corrosion Protection Properties of Coal Tar Epoxy Coating". 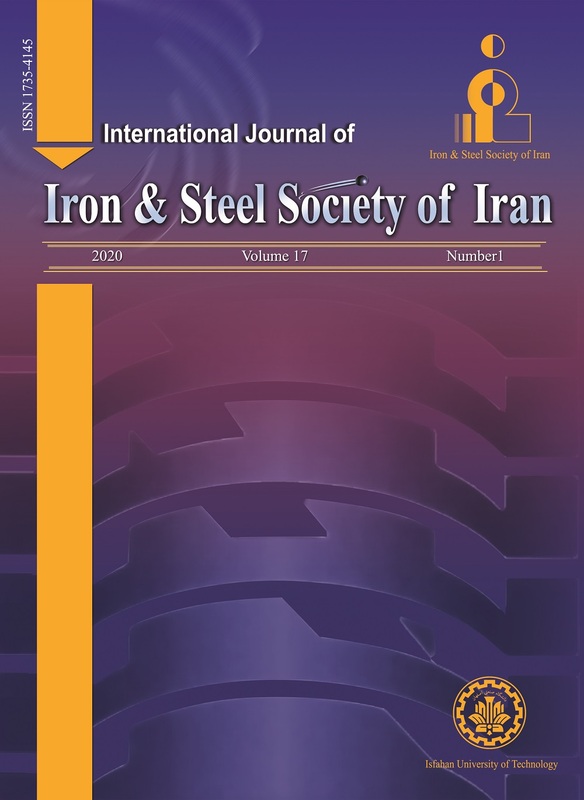 International Journal of Iron & Steel Society of Iran, 11, 2, 2014, 17-22. Atapour, M., Abdollahi, S., Monir Vaghefi, S. (2014). 'The Effect of Erosion on Corrosion Protection Properties of Coal Tar Epoxy Coating', International Journal of Iron & Steel Society of Iran, 11(2), pp. 17-22. Atapour, M., Abdollahi, S., Monir Vaghefi, S. The Effect of Erosion on Corrosion Protection Properties of Coal Tar Epoxy Coating. International Journal of Iron & Steel Society of Iran, 2014; 11(2): 17-22. In this work, the effect of erosion on corrosion behavior of coal tar epoxy coating was evaluated using electrochemical impedance spectroscopy (EIS) measurements. The surface morphology of the coating was examined by scanning electron microscope (SEM) after 10, 20, 30, 45 and 60 min of erosion process at an impact angle of 90º. After 10 min of erosion process, the Nyquist plots showed just a single large capacitive semicircle and the phase Bode plots exhibited a line close to −80o in the middle-frequency region, thereby indicating high corrosion resistance (about 109 Ωcm2). After 20 and 30 min of erosion process, the diameter of the Nyquist semicircle was decreased with time and two semicircles appeared after 45 min. Furthermore, SEM observations revealed that the protection performance of coating was decreased by an increase in time of erosion due to the formation of holes and electrolyte penetration into the coating. Finally, after 60 min of erosion process, the coating was partially removed and the substrate appeared. S. P. Sitaram, J. O. Stoffer, and T. J. O'Keefe: J. Coat. Technol., 69(1997), 65. Y. Gonzalez-Garcıa, S. Gonzalez, and R.M. Souto: Corros. Sci., 49 (2007), 3514. R.I. Trezona, I.M. Hutchings: Prog. Org. Coat., 41 (2001), 85. R.J.K. Wood: Mater. Design., 20(1999), 179. E. Bardal, Corrosion and Protection, Second ed., Springer, London, 2004. G.A. Zhang, L.Y. Xu, Y.F. Cheng: Corros. Sci., 512 (2009), 283. M. Grundwurmer, O. Nuyken, M. Meyer, J. Wehr, N. Schupp: Wear 263 (2007), 318. A. Levy: Surf. Coat. Technol., 1 (1998), 387. E. Scrinzi, S. Rossi and F. Deflorian: Surf. Coat. Technol., 203 (2009), 2974. A. Husain, O. A1-Shamali, A. Abduljaleel: Desalination 166 (2004), 295. E. Akbarinezhad , F. Rezaei, J. Neshati: Prog. Org. Coat., 61 (2008), 45. R. C. Bacon , J. Smith and F. M. Rugg: Industrial & Engineering Chemistry., 40(1948), 161. L. Jianguo, G. Gaoping, and Y. Chuanwei: Electrochim. Acta., 50 (2005), 3320. M. Kendig, J. Scully: Corrosion., 46 (1999), 22. B. Valentini, J. Fiora, G. Ybarra: Prog. Org. Coat. 73 (2012), 173. X. Zhang, F. Wang, Y. Du: Prog. Org. Coat., 53 (2005) 302. H. Marchebois, M. Keddamb, C. Savalla: Electrochim. Acta., 49 (2004), 1719. A. Suresh, A.P. Harsha, M.K. Ghosh: Wear., 267 (2009), 1516.